So I know all of you were sitting on the edge of your seat, biting your nails just dying and waiting for me to post my part 2 of S/S 2014 makeup wardrobe!! But I'm quite certain that wasn't the case. However, I am SURE the only ones who were waiting for this were my overly obessed proteges who O.D. daily on cosmetics and makeup trends (yes I'm talking about you Bri, Neen & Von). Anyway, I've been gone for so long with a pretty bad ankle sprain. Somehow that sprain SPREAD and crawled up into my fingertips which caused me not to give you guys the "need to know" for S/S 2014 eyes and lips. My deepest apologies! However, since Memorial Day is a few days away and the first day of Summer isnt until June 21st, I figured there is still time for me to inspire my fellow makeup junkies of the world. Create that slept-in look with the blackest BLACK eyeliner. Ok so lets get down to business: Summer-time Eyes! In my last blog, I talked about SIMPLICITY with NUANCES. Keep that aspect in mind when you get ready to do your eye makeup. So you have on your new Lavender-colored blouse and I'm sure you're ready to pull out your MAC Beautiful Iris lavender eyeshadow (one of my faves) but this summer its not about matching your eyeshadow to your outfit. One BIG trend for eyes: show off the shape and flirtyness of the eye. So put the lavender eyeshadow back in your makeup bag and pull out black...yes BLACK. Start with the eyeliner. It can be cream, liquid, or pencil as long as its black. You'll also need your blackest mascara. Remember those strip lashes you brought a while back - you'll need those too. YEP, its time for the FALSIES!!! However, I know you may be thinking...how is this in trend for 2014? Are makeup trends being reprocessed?? Well remember, skin is glowy and feminine; brows are not overly groomed or sculpted; there are pops of color on the cheeks and lips along with subtle shimmer to help create a light effect to the skin. This means the eyes have to be kept timeless and classic. The liner has a 90's slept-in feel to it, not goth but feminine. The lashes look "DOE-EYED", creating a very 60's lash. A simplistic eye doesnt mean the eyelids should be kept bare. The eyes are translucent with a natural hue. 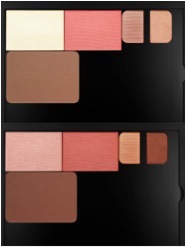 You can achieve this look by using Benefit's Creaseless Cream Eyeshadow in Peach Parfait, Venetian Brown or Butter Cream. While getting your Benefit eyeshadows, dont forget your "They're Real!" 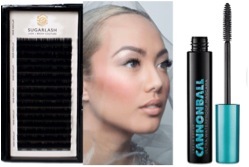 Mascara from Benefit and your Red Cherry Lashes #13 to help create that 60's lash. If you want to get that modern day Twiggy look, pop on some Tokyo bottom Lilly Lashes. Now that we have your eyes in trend, lets tie it in with the oh-so-popluar lip trend we are all obsessed with. The colors have a Barbie-Doll like feel to the lips. Unusual colors like pastel lavender and bright coral reds. The texture this season can be creamy, glossy or matte, its just all about using color in a non-traditional way. 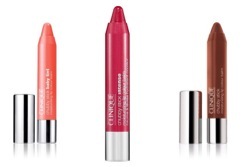 Try Flare lipstick by Illmasqua or Coral Blossom Lipstick by Tarte to accessorize your SS makeup wardrobe. Usually during fall, skin is typically matte. However, this fall and winter, have it YOUR way! Whether you prefer matte or dewy, the main focus is using different textures on the skin to create a 3-D, realistic look. And guess what??? Contours are added back in a big way (not that they ever really went away). A/W 2014 has a strong focus on EYES. The "windows to the soul" will have a architecturally strong, glam-grunge look which will be complimented with the return of *drum roll please* a strong brow....all pulled together in a modern way. Do I have you hooked yet?!?! Want to know the other trends??? Stay tuned for A/W 2014 MAKEUP Trends and I PROMISE I wont stay away as long XO💋💄.